One hundred normal Indian subjects were studied to establish the normal left atrial dimension (LAD), left atrial dimension cor­rected to body surface area (LA index) and left atrium to aorta ratio (LA/AO) for this population. 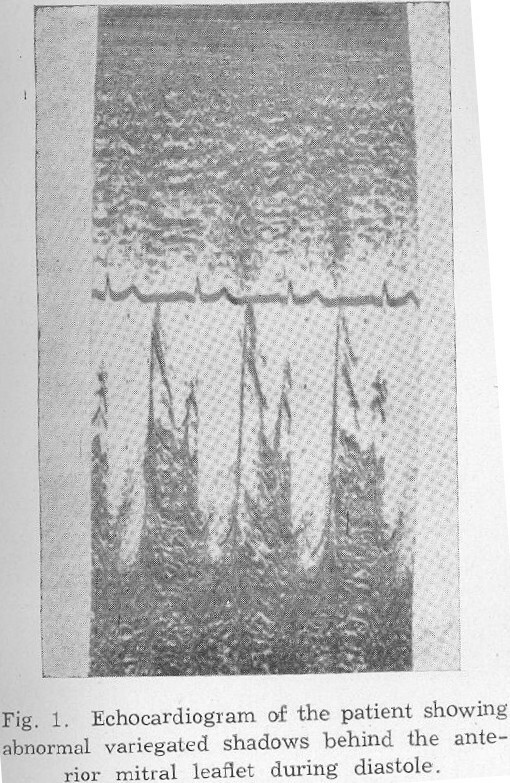 Normal mean LAD was 21.9 ± 3.6 mm (12 mm to 30 mm). Elderly subjects had higher mean LAD (25.2 ± 3.6 mm). The LA index for adults was 14.1 ± 2.5 mm. LA index for younger subjects was higher because of low body sur­face area. Mean LA/AO was 0.95± 0.22;LA/AO greater than 1.17 is suggested as a criterion for LA enlargement. Eighty patients of isolated mitral stenosis were studied echo­cardiographically to assess the nature of the stenosed mitral valve as this seems to have a significant bearing on the surgical treatment of mitral stenosis. Echocardiographic findings were compared with the surgical observations and correlated with the post-operative re­sults. EF slope did not have significant correlation with surgically estimated mitral valve area. Calcification was found in 21.25% patients. Leaflet echo thickness as a sign of mitral valve calcifica­tion has a high sensitivity (88%) though it lacks specificity (42%). A combined echo graphic sign of leaflet echo thickness of greater than 6 mm, and an opening amplitude of less than 16 mm was asso­ciated with an adverse outcome (mitral regurgitation) in 41.6% patients, compared to an incidence of 21% in the remaining. Interventricular septal motion is studied in sixty tow cases clas­sified into 3 groups; Gr. 1-right ventricular volume overload (RVVO); Gr. II-combined right ventricular volume overload and left ventricular volume overload (RVVO + LVVO); Gr. III-com­bined right ventricular volume overload and right ventricular pres­sure overload (RVVO + RVPO). 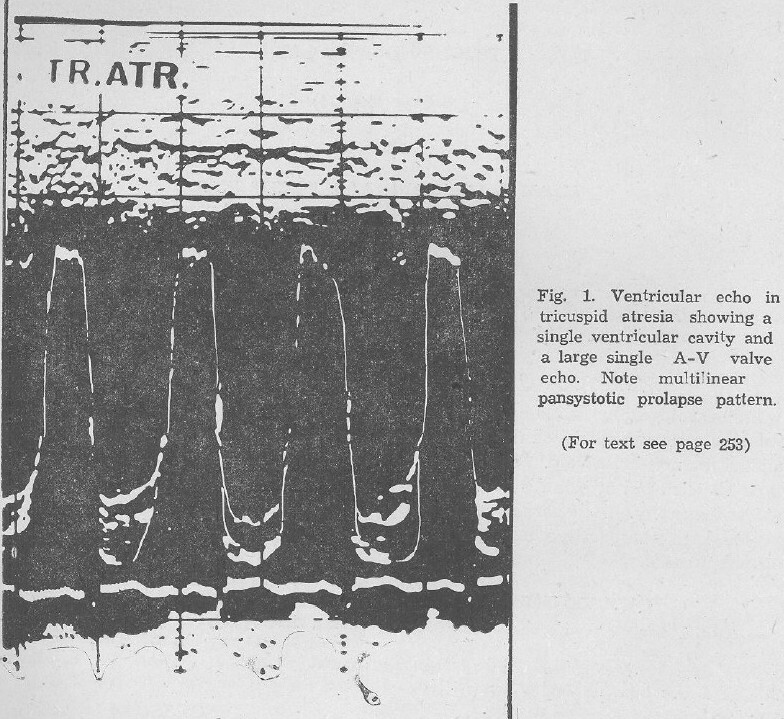 A linear relationship was obtained between the right ventricu­lar dimension index (RVDI) obtained echocardiographically and the magnitude of the left to right shunt at the atrial level (Qn/Qs). Two rare instances of false negatives in a hemodynamically in­significant left to right shunt and in a large ASD are reported. Modification of abnormal septal motion in Gr. II and Gr. III is studied. Lesion specific features of certain anomalies i.e. Ebstein's ano­maly, total anomalous pulmonary venous return (TAPVR) and en­docardial cushion defects (ECD) are discussed. Echocardiographic features of interventricular septum were studied in four patients with constrictive pericarditis. 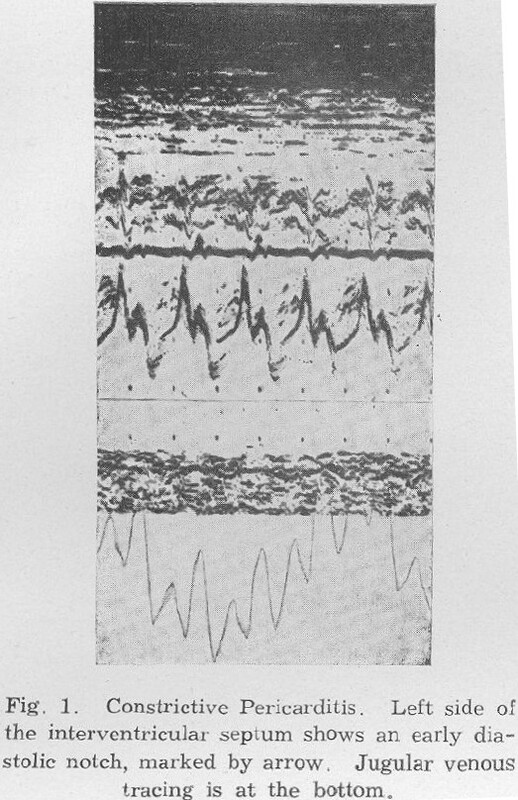 The systolic motion was normal in one patient and paradoxic in the other three. All four patients had an abrupt anterior motion which was followed by a sudden brisk posterior motion immediately in early diastole, following the diastolic dip of the septum. This motion was coinci­dent with the `y' trough of the jugular venous pulse. 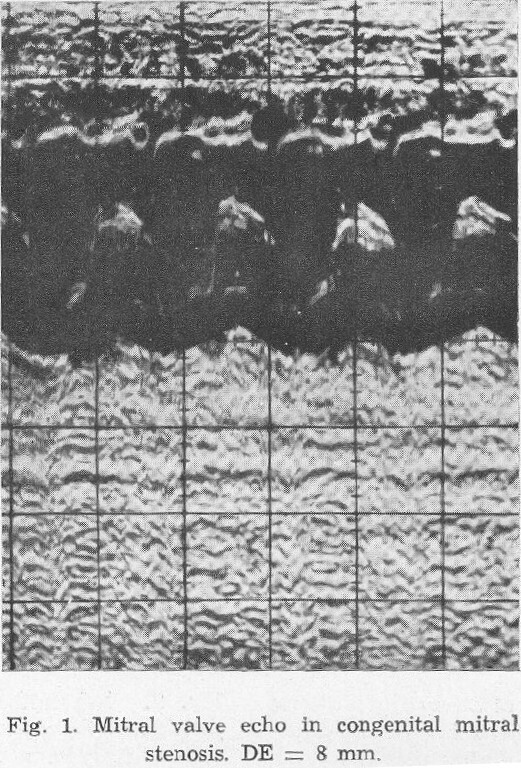 The septal thickening values were within normal range. 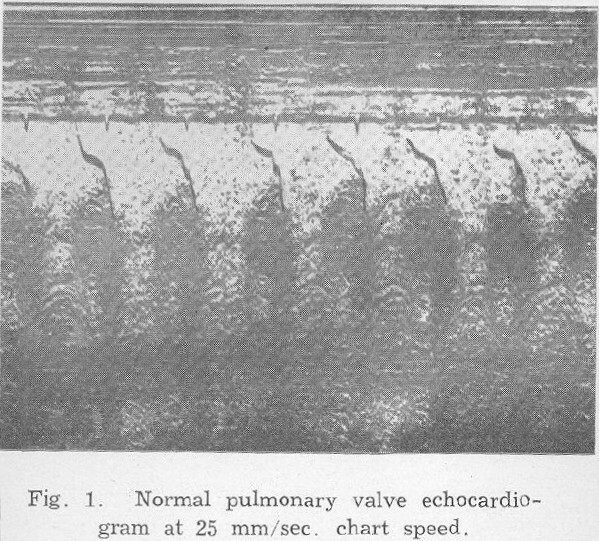 Pulmonary valve echocardiography has been done in 11 cases of pulmonary hypertension, and 4 cases of right ventricular outflow tract obstruction, either at valvar, infundibular or combined level. 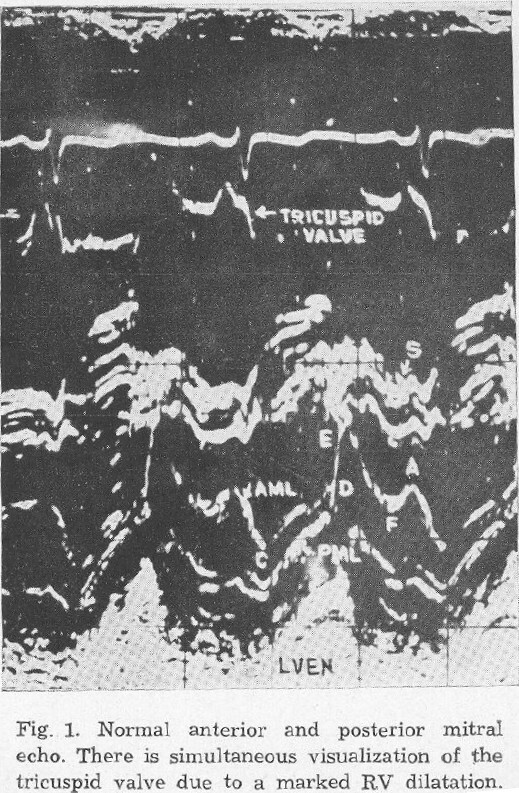 Absence of `a' wave was noted in 6 out of 10 cases in whom dia­stolic gradient across the pulmonary valve was more than 25 mm of mercury. Accelerated 'bc' slope was found in all the 11 cases of pulmonary hypertension. 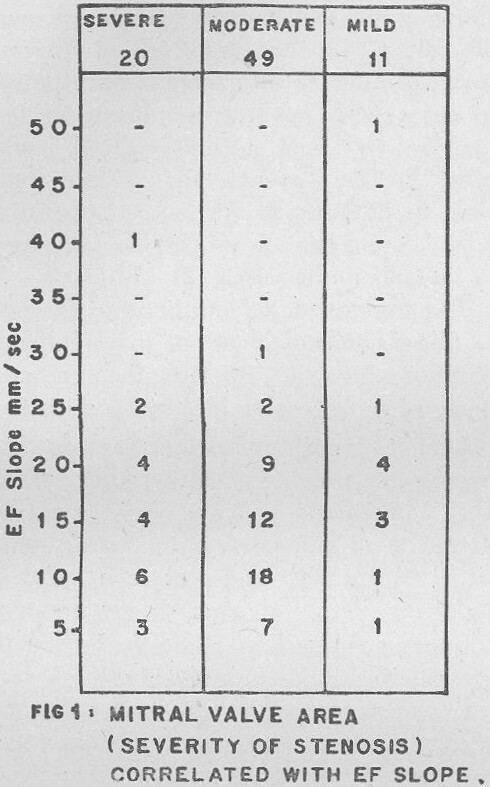 Two patients had negative and 6 had flat `ef' slopes. Remaining 3 patients had normal 'ef' slope despite hav­ing moderately severe pulmonary hypertension. Only three of our patients had shown midsystolic closure and fluttering of pulmonary valve. In right ventricular outflow tract obstruction one patient with valvar and infundibular stenosis had shown presystolic opening of the pulmonary valve with fluttering of the leaflets during systole. Three other patients had no remarkable features. Four cases of left atrial myxoma were diagnosed pre-operatively by echocardiography. 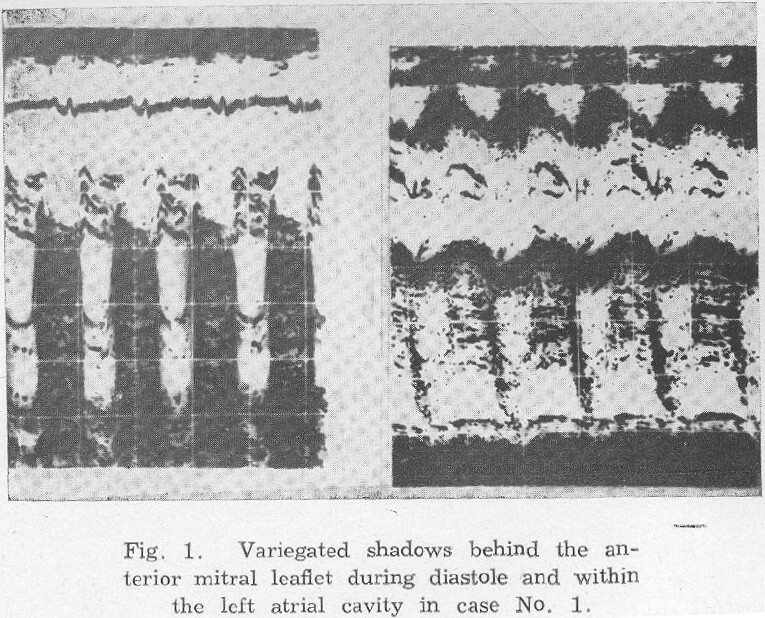 All cases showed characteristic echocardio­graphic features of variegated shadows behind the mitral valve in diastole and within the left atrium in systole. In two cases the my­xomas were surgically removed and confirmed on histology. 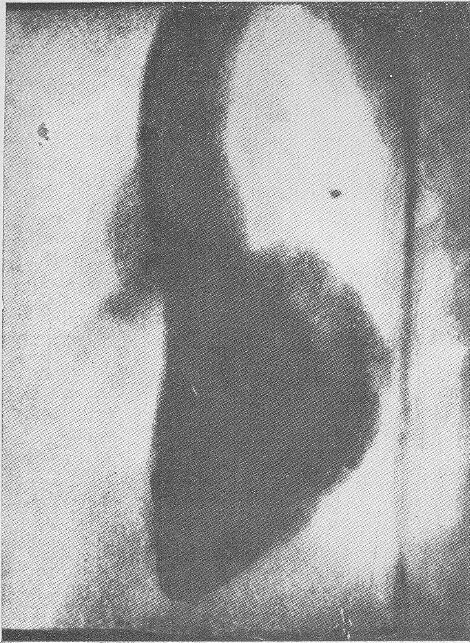 In one case the post-operative echocardiogram showed complete dis­appearance of the abnormal shadows. Echocardiography is the most reliable method today for the diagnosis of a myxoma. This is a report of an unusual case showing a mitral valve pro­lapse in the presence of a biventricular endomyocardial fibrosis (EMF). 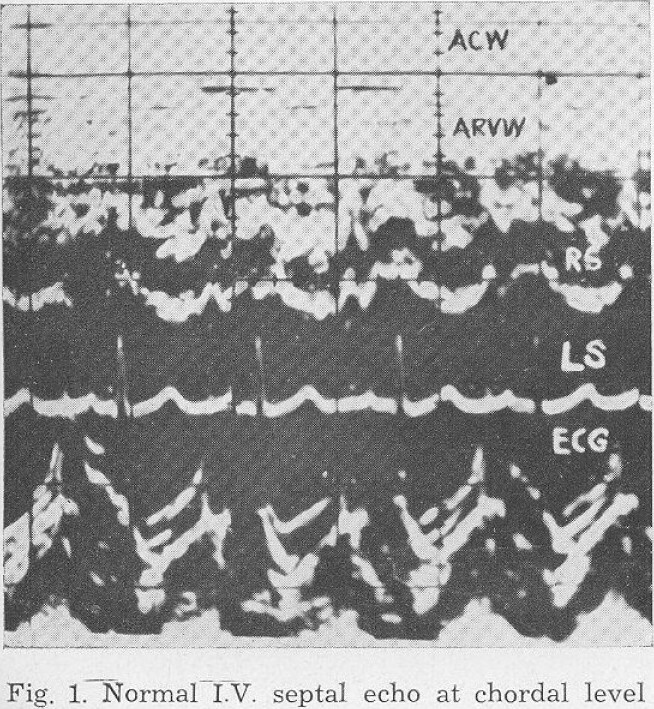 The EMF was strongly suspected on left ventricular angio­graphy and later proved at autopsy. 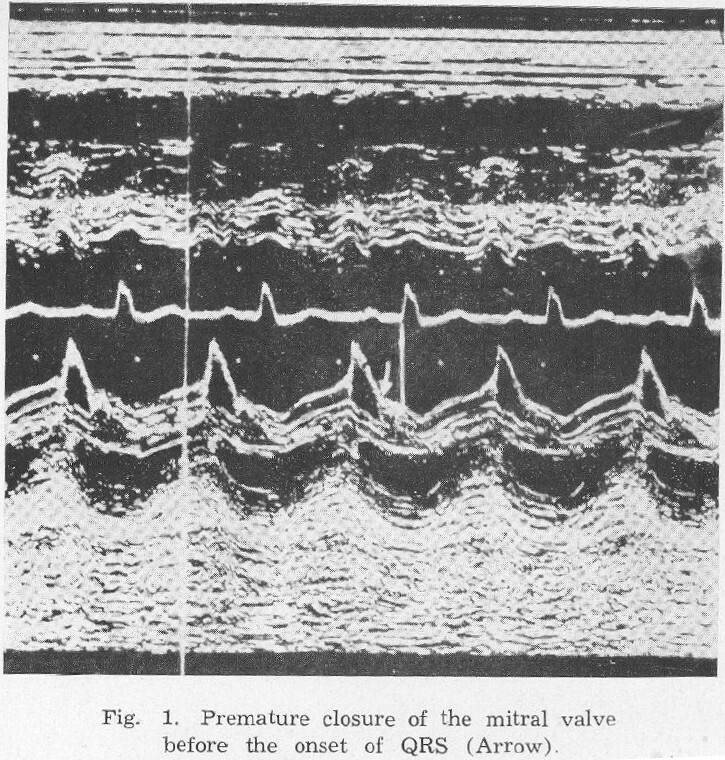 The prolapse of the mitral valve was detected at echocardiography. To the best of our knowledge this is the first report of a case of EMF associated with mitral valve prolapse. This is a case report of a patient who presented clinically with features of mitral valve prolapse. 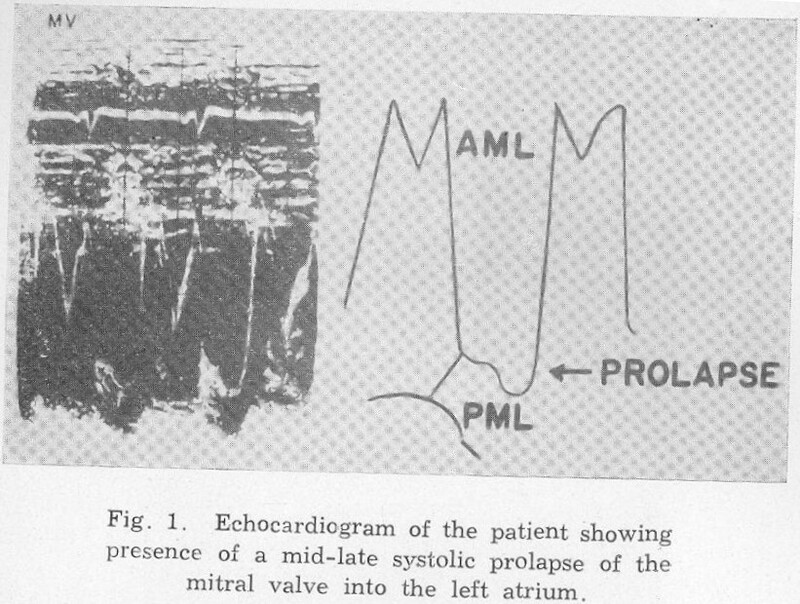 Echocardiography revealed, in addition to a systolic mitral valve prolapse, variegated shadows be­hind the anterior mitral leaflet characteristic of a myxoma. At sur­gery the prolapse of the posterior mitral leaflet was confirmed, but no myxoma was present. This case represents a rare false positive echocardiogram suggesting a myxoma in a patient with prolapsed mitral valve. Echocardiographic features of congenital mitral stenosis in a six year old female child is described. A significantly reduced ampli­tude of anterior mitral leaflet (8 mm.) 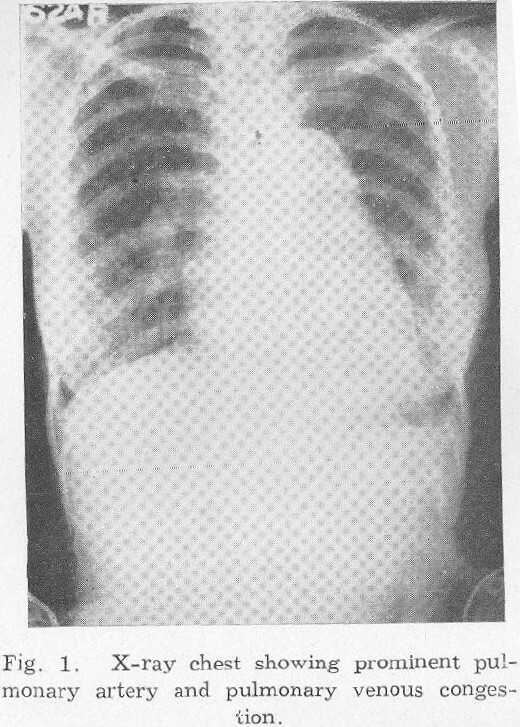 in early diastole suggested a tight mitral stenosis with moderate degree of hypoplasia of the left ventricle. Post-operatively echocardiogram was repeated; it was compared with the pre-operative echocardiogram. 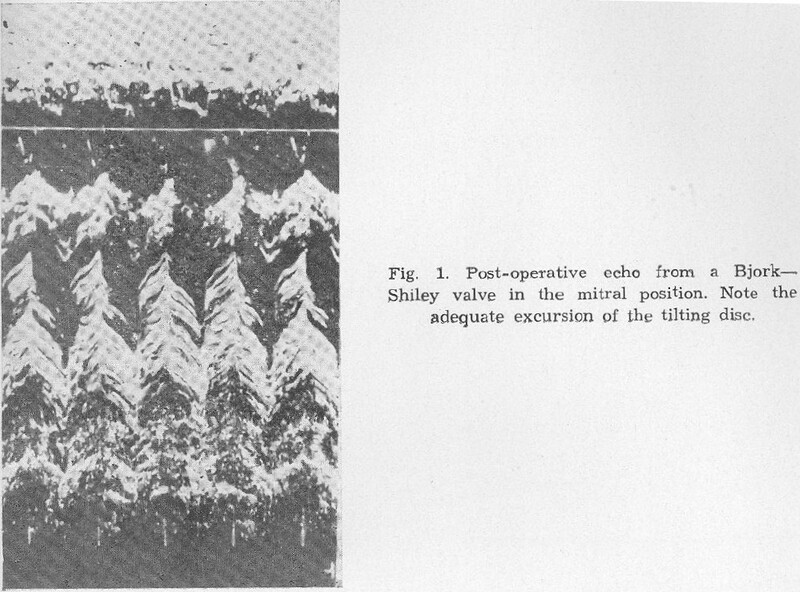 Echocardiographic features of idiopathic hypertrophic subaortic stenosis (IHSS) are described. 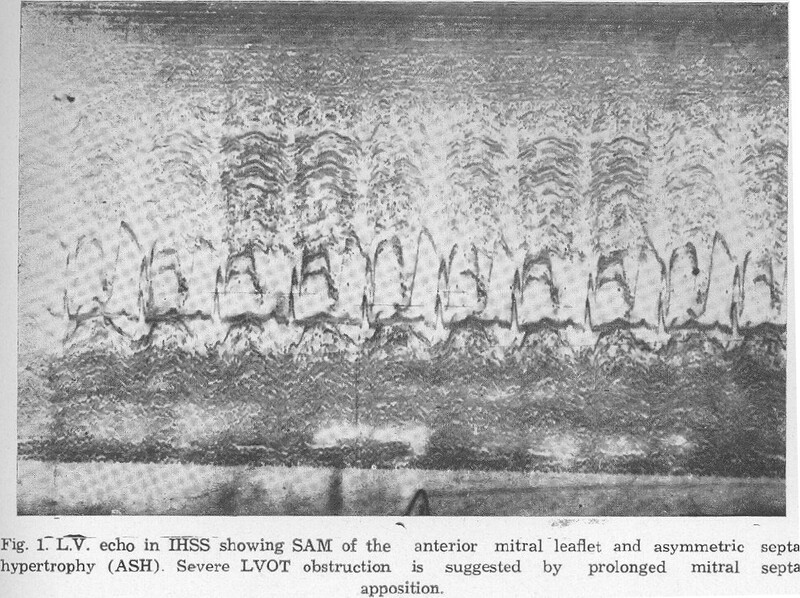 Systolic anterior motion (SAM) of anterior mitral leaflet and asymetric septal hypertrophy (ASH) are considered as the diagnostic criteria of IHSS. Effects of amyl nitrite and propranolol-a beta blocker are studied. Echocardio­graphic screening of family members revealed this as a case of fami­lial IHSS. A case of false negative mitral valve echo gram in a case of Lutembacher's Syndrome is reported. 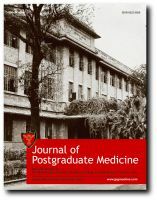 In our understanding this is the first case report in the literature. Echocardiographic features of an aneurysm of membranous in­terventricular septum are presented in a case of coarctation of aorta with membranous interventricular septal defect. The diagnosis was made by angiography. Interesting echocardiographic features in a case o f acute onset aortic regurgitation due to infective endocarditis of bicuspid aortic valve are reported. Early closure of mitral valve (ECMV) recog­nised by echocardiography confirmed the clinical diagnosis of acute inset aortic regurgitation. 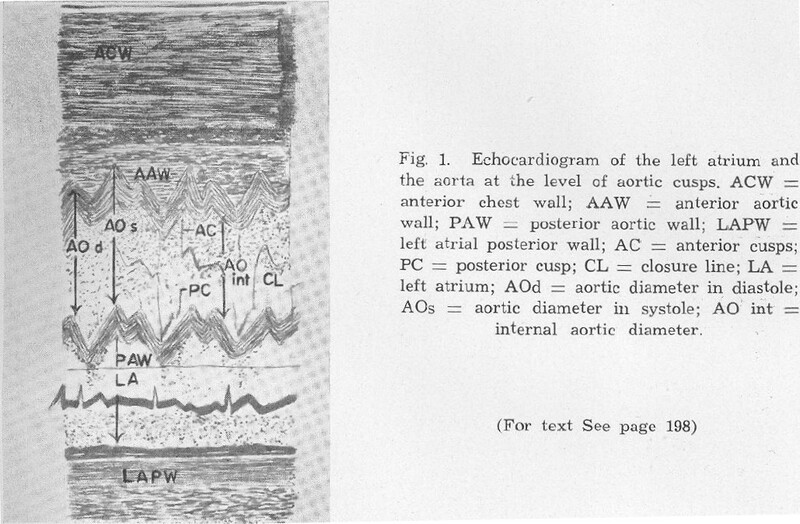 Aortic root echocardiogram showed ec-centric diastolic closure line of bicuspid aortic leaflets and multiple echoes on aortic leaflets due to bacterial vegetations. A case of left atrial thrombus in Bjork Shiley mitral valve pros­thesis is reported. 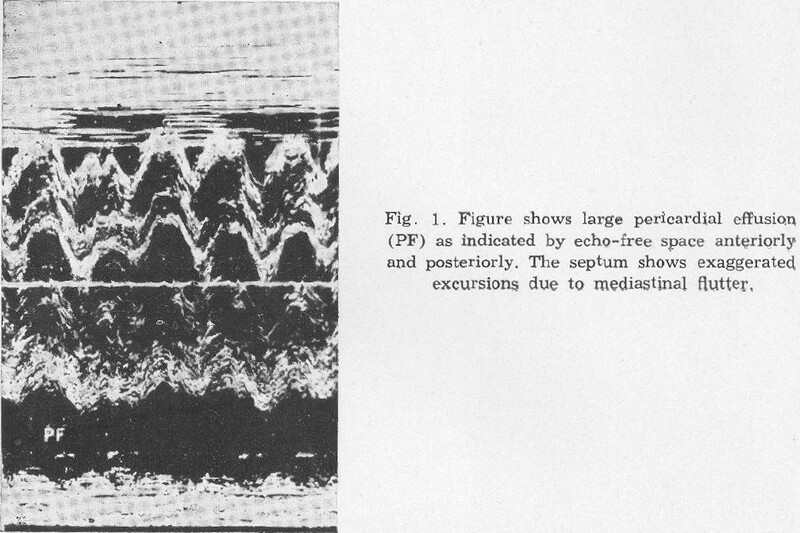 Detection of pericardial fluid by non-invasive ultrasonic techni­que is reported in a case of myxedema. Mediastinal swing and pseudo mitral valve prolapse are demonstrated. Equally increased thickness of the interventricular septum and left ventricular poste­rior wall may be due to myxedematous infiltrative changes. Echocardiographic features o f a proven case o f tricuspid atresia type 1B are discribed. An interesting finding of mitral valve pro­lapse in tricuspid atresia is reported. Cardiac ultrasound/Echocardiography is a. simple, safe and non-invasive method for detecting heart diseases. When combined with ECG, X-ray and isotopic studies, ultrasound provides signifi­cant diagnostic information not previously available. M-Mode technique gives a unidimensional representation of movements of various structures of the heart whereas stop-action imaging or real time imaging gives a clear two-dimensional view of the various sections of the heart, thus permitting a comparison of anatomical juxta-positioning and continuity.